Most physical therapy private practices use the same, or similar set of diagnosis and treatment codes in outpatient physical therapy practice. Physical therapy billing requires a careful selection of ICD-10 and CPT codes to maximize reimbursement. Physical therapy coding is a critical part of every clinic’s cashflow. We’ll focus on physical therapy ICD-10 guidelines in this article. If you’re more interested in treatment codes, check out the resource on the most common physical therapy cpt codes. ICD-10 codes represent diagnosis, and are the foundation of physical therapy coding. These codes are used by providers and physical therapy coders to classify ailments and injuries. This is a prerequisite for compliant documentation and claim reimbursement from payers. ICD-10 is a vast and, to many, an overwhelming system – so much so that there are physical therapy coding companies who specialize in creating properly coded claims for practices. ICD-10 was endorsed by the World Health Assembly in May 1990 and has been in use in WHO Member States beginning in 1994. ICD-10 went into effect for the U.S. healthcare industry on Oct. 1, 2015, after a series of lengthy delays. While ICD-10 can be confusing, it is a superior system, especially for physical therapy coding largely due to its diagnostic specificity. In other words, the clinician can (and is now expected to) get really specific about the diagnosis of the patient. Specific improvements in physical therapy related diagnosis codes include expanded injury codes, combined codes, laterality codes and greater specificity in code assignment. 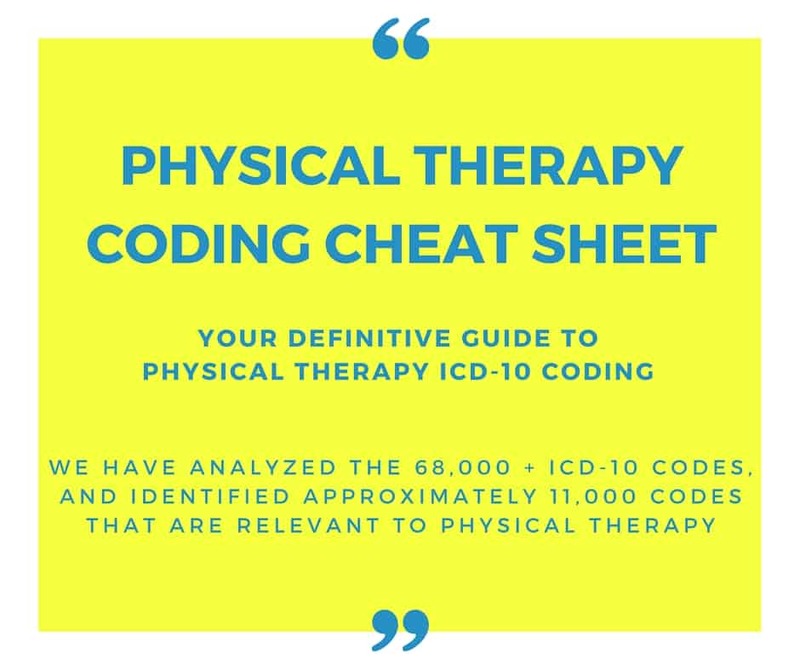 With the complexity and confusion surrounding ICD-10, the staff at In Touch Billing has put together a physical therapy coding cheat sheet, geared specifically for ICD-10. 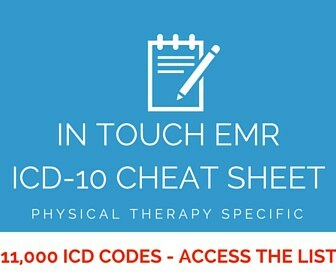 This is a list of ICD-10 codes commonly used in physical therapy coding. We have analyzed the 68,000 + ICD-10 codes, and have identified approximately 11,000 codes that are relevant to physical therapy billing and coding. In Touch Billing has spent over 100 hours to organize this document, and we’re making this available to the entire physical therapy community to show you how awesome we are (and to earn your business if you ever look for a physical therapy emr, physical therapy billing software, or physical therapy billing service). We have accounted for every imaginable condition treated by physical therapists, which is why this document contains almost 11,000 line items. Click the button below to gain access to this list. Please note that this list is not exhaustive and should not be used exclusively; accompany them with the ICD-10-CM Official Guidelines, tables, and index. You should certainly know which ICD-1o codes are specific to physical therapy and rehabilitation (so you can bill them), but you should also know which ICD-10 codes are truncated / unspecified / invalid (so you can avoid them). That’s why we have created another list for you…. Clinicians aren’t physical therapy coders, and shouldn’t be expected to know the ins and outs of the complex world of physical therapy billing and coding. All ICD-10 codes must be documented to the highest level of specificity. Truncated / invalid / unspecified ICD-10 codes will result in rejections. That’s why we did something significant for our readers. The ICD-10 certified coders at In Touch Billing, the sister company of In Touch EMR, have analyzed all the ICD-10 codes, and put together a comprehensive tool. 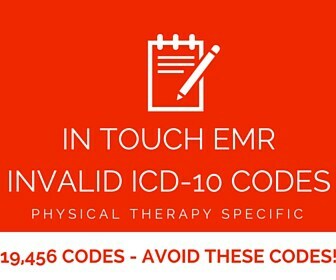 We have created a list of truncated / invalid / unspecified ICD-10 codes to help physical therapy providers, billers and coders. We went to great lengths to create this, by reviewing every single ICD-10 code, we didn’t just search for ‘unspecified’ codes and give you that list. We worked much harder than that. Click the button below to gain access to the entire list of ICD-10 codes to avoid. Here’s a summary of the data you can expect in this groundbreaking list. The asterick * indicates unspecified / invalid / truncated ICD-10 codes that must be avoided. Non specific codes will result in claim rejections at the clearinghouse or payer level. If this happens, clinicians / billing will need to re-code to a high level of specificity and resubmit. This includes codes from the C, D, F, G, H, I, J, M, N, R, S, T, V, W, X, Y, Z family of ICD-10 codes that fall into the truncated / invalid / unspecified category and must be avoided. The easiest way to simplify and streamline the coding aspect of documentation is to utilize an EMR that has built in ICD-10 technology to help clinicians choose the best (and most specific) codes. In Touch EMR not only includes extensive ICD-10 technology, but is backed by an expert team of ICD-10 certified physical therapy coders at In Touch Billing. Physical therapists and clinic owners benefit with a compliant, current system, with a qualified team to support it. In Touch EMR is a fully customizable EMR, certified by the Federal Office of the National Coordinator so that physical therapists can rest assured that they are using the most compliant and secure system possible. In Touch Billing, which is an add-on service with In Touch EMR, has helped thousands of therapists get higher reimbursements at well below average costs for billing services. If you can’t wait, here is a quick, 10 minute walkthrough of the In Touch EMR software. Here is a 10 minute demo of the In Touch Biller Pro software – the fully integrated revenue cycle management and billing software from In Touch EMR. In Touch EMR is a fully integrated scheduling, documentation and billing software for physical therapy practices. It is a simple and user friendly web-based, ICD-10 and HIPAA compliant EMR, and it offers customizable templates for notes, the ability to attach files, electronic signatures, and the ability to track progress notes, treatment plans, and assessments. Please click here for a brochure of In Touch EMR. (please right click and choose ‘save as’ to download the brochure). Click here for answers to your most frequently asked questions about EMR selection and transition. In Touch EMR has grown to over 1000 clients, our company / founders have been mentioned on CNN, Forbes, Huffington Post, Amazon, been featured as a Cleardata success story, received the prestigious ONC certification, 2015 and 2016 PQRS registry designation, integrated with Microsoft’s cutting edge patient portal technology and initiated groundbreaking healthcare partnerships with companies like Novartis. All of this is possible thanks to clients across the country, who have embraced In Touch EMR. In Touch EMR is featured on our HIPAA compliant hosting partner (Cleardata) website along with other industry leaders such as the Cleveland clinic, Nexttech, Saint Mary’s regional medical center and UCLA health. At In Touch EMR, we charge a flat fee per licensed clinician (no hidden fees or surprises) and it includes everything, unlimited claims and notes and infinite custom template creation. We are also a CMS recognized PQRS registry, we automate the reporting of PQRS and Functional Limitation G codes and provide automatic alerts for plan of care expirations, authorizations, progress note reminders and KX modifier alerts. Clients also get a self-paced video training program on how to get up and running, custom documentation template builder, iPad app – one touch document import, Instant Intake iPad app, unlimited patient manager and patient portal. Every license unlimited ongoing support (phone / email / live chat), billing software integration, unlimited appointments, unlimited documentation, unlimited document uploads and unlimited electronic faxing. We are a premier vendor in the rehabilitation space, and on the prestigious, certified Health IT Product List, which is a division of the office of the National Coordinator for Health Information Technology, a division of the Department of Health and Human Services. Very few vendors can make this claim, and they generally won’t bring this up (in some cases, out of ignorance) mostly because this is not a mandatory certification, it is optional and requires a significant investment of time and effort. This certification is a sign of our commitment to a HIPAA compliant, secure and stable EMR system for your clinic. Since In Touch EMR has been very proactive at staying at the forefront of emerging guidelines for EMR vendors, you are assured higher quality, higher security and more compliance with CMS and other payer regulations. In Touch EMR is on the Certified Health IT Product List (CHPL) website. All In Touch EMR customers get unlimited support via phone, email and live chat. Click below to schedule a free demo with the experts at In Touch EMR, or call (800)-421-8442 to learn more. At In Touch EMR, we charge a flat fee per licensed clinician (no hidden fees or surprises) and it includes everything, unlimited claims and notes and infinite custom template creation. We are also a CMS recognized PQRS registry, we automate the reporting of PQRS and Functional Limitation G codes and provide automatic alerts for plan of care expirations, authorizations, progress note reminders and KX modifier alerts. Schedule a demo to see why practices across the country are switching to In Touch EMR.